Star Wars ABC's continues this Tuesday with "O." Whether you call him Owen Lars, Uncle Owen, or simply "Luke's psychologically abusive uncle," he's an important character in the Star Wars universe. 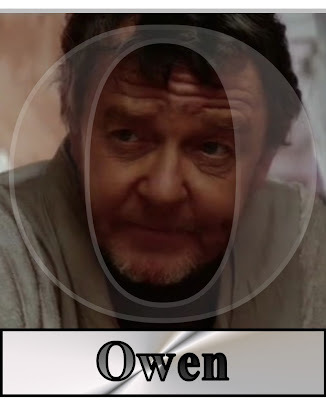 While Obi-Wan watches the galaxy's new hope from a distance, Owen and his wife Beru are tasked with raising the boy. Owen is the crotchety old guy you can never quite please; the man who wears a mask of disapproval no matter what you do. He is resentful and spiteful, but he has his reasons. He watched his stepbrother fall to the Dark Side (in a bit of prequel retroactive continuity, of course), something he wants to prevent from happening to young Luke. How continually berating his nephew and keeping him from doing anything even slightly stimulating in his life will protect him from the Dark Side is beyond me.